Manulife-Sinochem Life Insurance Co. Ltd. (hereafter called “Manulife-Sinochem Insurance” for short) is the first Sino-foreign joint ventured life insurance company in the country, and was jointly ventured by Manulife Insurance (International) Co. Ltd., the subsidiary of Canada Manulife Finance, and China Foreign Economic Trade Trust Investment Co., which is subordinated to China Sinochem Group Corporation.Manulife Sinochem Insurance was established in November 1996, presently, has 13,000 employees and representatives, and provide professional finance insurance services in order to surpass 500,000 customers. 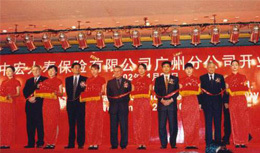 In November 2002, Manulife-Sinochem Insurance established the first jointly ventured Sino-foreign insurance company approved by China Insurance Regulatory Commission, Guangzhou Subsidiary Company (presently called Guangdong Subsidiary Co.) formally opened up Business; In may 2004, Manulife-Sinochem successfully established Beijing Subsidiary.At present, Manulife-Sinochem has developed business in over 40 cities in the country such as Shanghai, Beijing, Guangdong, Zhejiang, Jiangsu, Sichuan and Shandong, and will go on to expand business all over the country. Manulife-Sinochem has followed the professional spirit, and endeavor to provide high quality services for the consumers both home and abroad, and continuously create new products based on the needs of domestic and international consumers.Manulife –Sinochem not only has been awarded the honor “Trustworthy Service Model Enterprise”, but also attract consumers with good quality products which obtained many prizes in different campaigns and competitions.On going development of insurance industry of China, Manulife-Sinochem ensures customers’ interest by uprightness attitude, strictly regulated finance system, steady and effective operation.Meanwhile, Manulife-Sinochem offer golden job opportunities for the excellent professionals, try our best to become the most optional employer in the country. In addition, Manulife-Sinochem Insurance is the life insurance cooperative partner in Beijing 2008, as an exclusive life insurance company that provides related sevice for Beijing 2008 Olympic Games.